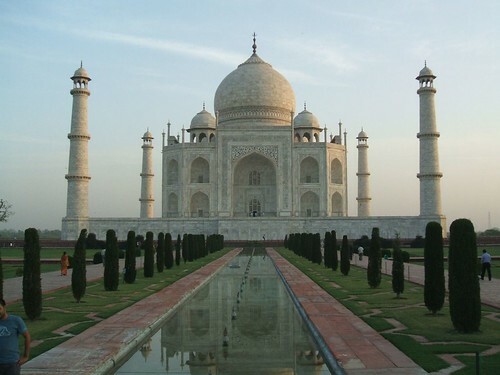 The Taj Mahal is said to be one of the most romantic structure in the world. The mere mention of it evokes amorous and sensual feelings. It is, after all, a monument to eternal love. 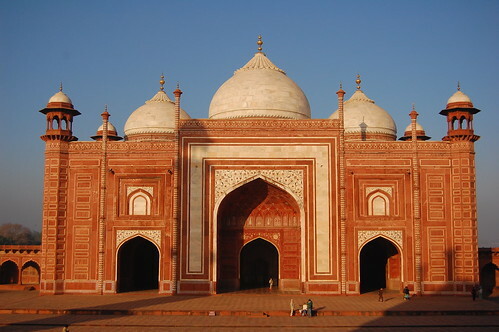 The emperor Shah Jahan, had the Taj Mahal built in memory of his beloved wife Mumtaz Mahal. As the story goes, he loved her deeply and was grief-stricken after she died giving birth to their child. So sad in fact, that he started the construction only a year after her death. It now stands as a symbol of eternal love. 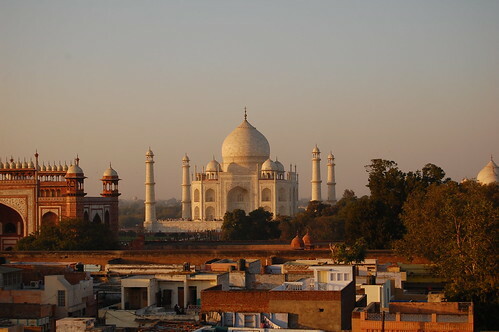 We arrived in Agra a few hours before sunset. We got lucky and found the Shanti lodge which boasted a rooftop deck with a fantastic view of the famed Taj Mahal. When we got there, I was frankly a bit disappointed. Every photo I took of the Taj Mahal looked ordinary. 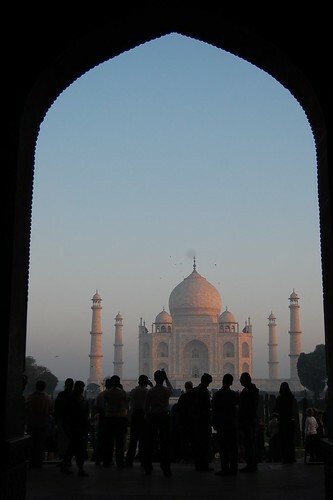 In the fading light, the Taj looked more distant than surreal. I couldn't stop myself from asking: That's it? After seeing the Taj in the light of dusk, we decided to spend the night in Agra. We wanted to visit the Taj Mahal early the next morning in the hopes that the light would be more magnificent and our visit more magical. We were duly rewarded. 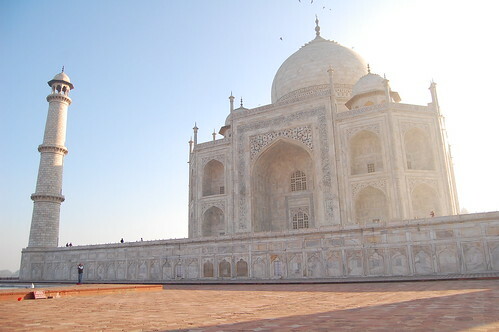 The Taj revealed herself fully in the faint morning light. She was majestic and pure and we were smitten. -Wear sandals or footwear that's easy to slip out of. You're required you to take your shoes off or wrap it in plastic once you step on the marble structure. We chose to hold on to our sandals and walk around barefoot. -Don't bring flashlights, lamps, whistles or tripods as these are not allowed inside. You will have to deposit them in a locker some meters from the gate. -You have to pay a hefty fee of 750INR to get in. The entrance fee to the Taj Mahal is only 250INR . But as a foreigner, you also need to pay 500INR to the Agra Development Authority.This fee can also be used as a 50INR discount for the Agra Fort and Akbar's Tomb. Compared to any other temple or tourist spot in India, this is quite expensive. Just think of it in comparison to a visit to the Louvre or the MOMA. It really is worth every paise. 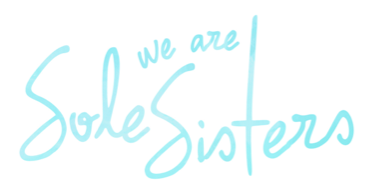 -There will be a lot of guides outside offering their services. It may give your tourist experience some historical insight. 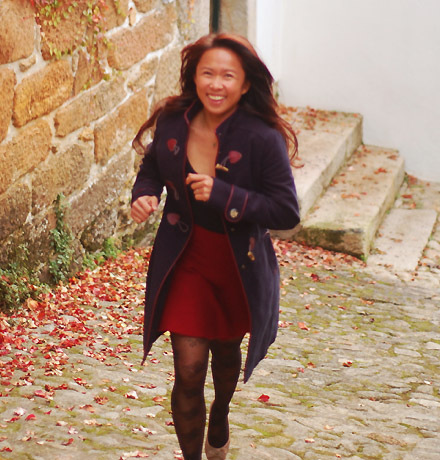 But if you are on a backpacker budget like us, it's best to skip this and just go exploring on your own. -Sunset or Sunrise? From experience, the best time to go would be during the wee hours of the morning. That's when the light is most beautiful. Although it does not make the crowds any smaller. The gate opens at 6:30AM and the line got very long in just a matter of minutes. This is probably the only opportunity you have to visit the Taj Mahal so you want your photos to be perfect. The light is at its most beautiful in the first few hours of the morning. But if you arrive late in the afternoon, sunset is a good alternative. High noon will make your photos look washed out or your skies too white. Upon entering the complex, you can get ahead of the crowd by going straight past the fountains to get closer to the Taj Mahal. That way, you can take as many 'pre-divorce Lady Diana on the marble bench' photos as you want with as few people in the background as possible. You can always get the famous pool reflection of the Taj Mahal as you head out. Make sure you go inside the mausoleum to admire the beauty of the finely cut marble but photography is not allowed here. The east side of the Taj Mahal makes great, though not as popular photos. The temples on the side of the Taj and the view overlooking the Yamuna river are also worth a few shutter clicks. From New Dehli, there are buses and trains going to Agra. It usually takes 3-4 hours to get to there, but the the train schedule in India is a mere suggestion. We arrived 2 hours late. 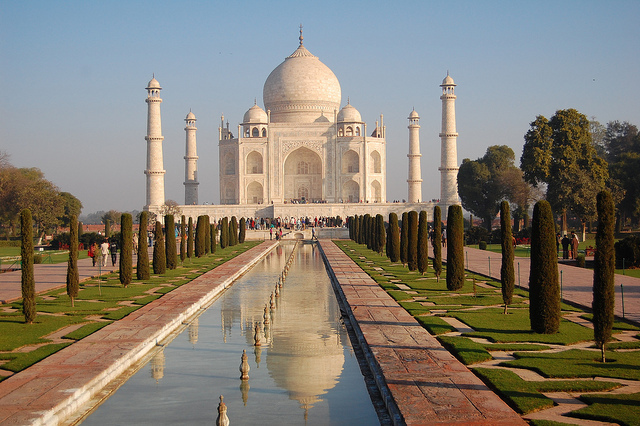 It's best to look for accommodation, get settled in and explore the Taj Mahal and other tourist spots on foot. 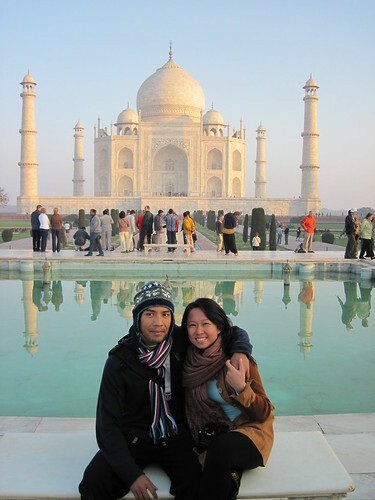 I think that finding ourselves in Agra, visiting the Taj Mahal in this month of love was no coincidence. The monument does get to you. It reminds you of how love should be: towering above us, universally recognized and most of all: so stunningly beautiful up close. It is a once in lifetime experience to have visited the Taj Mahal. I think it's enough to go once in your life. After all, the image and the feeling is with you for always. Where are you spending the day of love? Do share your stories by leaving a comment below. Your words keep me warm while I'm on the road. 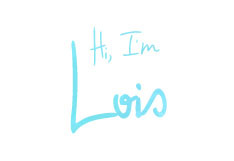 This is only part one of Lois Misadventures in India. 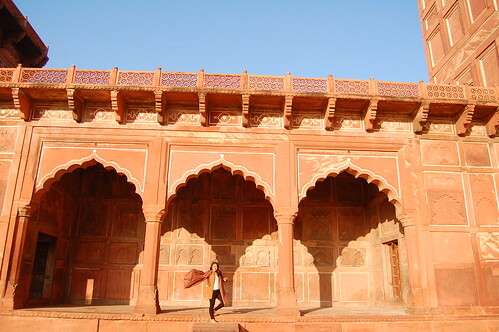 Next post: Pink City of Jaipur. Ganda!!! It's good that you stayed one more night just to see the Taj Mahal in its good lighting, sayang naman kung hindi niyo makunan ng maganda right since you're already there what's the rush? :D Were you guys went there with their Visa on Arrival? 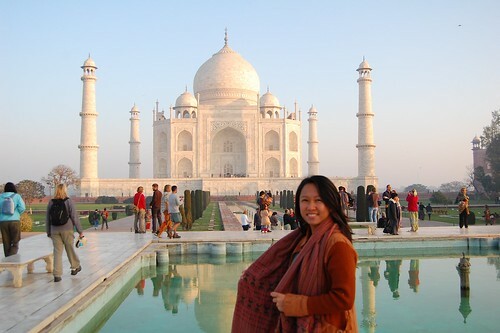 love the pictures Lois... nakakaencourage magpunta ng India just to see Taj Mahal. i can smell the morning in agra through this post! Exactly Ada! It's a once in a lifetime thing to visit the Taj. So we took our time and went the next morning. Para well-rested naman haha. I got my VISA in Manila na but I hear the VOA is pretty convenient. Hahaha... 5 days?! Wow... okay that may be too much time for me. I didn't busy myself too much with the technical stuff. I didn't even get to see the Agra Fort anymore. India is too big to explore for one short month. But yes Claire, you should really make it out here. Oh yes, I think a visit to India is not complete without making it to Agra for the Taj Mahal. Thanks you guys... India is so beautiful. my jaw drops further and further down with every place we visit. At syempre...the compulsory Robin Padilla-Marinel Rodriguez pic! LAHVET! @lakwatsera de primera: grabe yung five days to get that shot! Majestic - WoW. Guess every traveler needs to experience India at least once in their lives. wow! wow! di sya nakakasawang tignan. parang gusto ko na mag-book ng flight to india. hey flip! the india experience is all types of sensory overload. Dami na namin cities napuntahan in 10 days. Pero I think you will like Pushkar. I can't wait to write about it. Hahahaha... op cors Joel! Can't leave the Taj without THAT shot! I also want other people to experience the Taj Mahal Ed. And take lovely pictures of course. Hope you make it out there soon. Oh Yes! But in the 10 days I'm here. I realize that 1 month is not enough. And we are already making ouy way from north to south at that! Central India naman next. And yes, dapat kasama na Kashmir next time..
Mura lang flight namin James. Around 3k lang ata from KL to Delhi. Abangan mo ulit sale ng AirAsia. Para ka lang nag Palawan nun! The first photo is nice although na-o-o-c ako that the centerline is not straight. haha. Did u take photo standing at the end of the dotted line? Hindi ba magiging symetrical ang structure if u stand there? I love the photo#8 with the light ray. Thanks Lil! I didn't have such a great vantage point. And these photos were raw. No edits. Had to make it in time for V DAY ;-) Thanks for the photo comments. Love it when people notice the photography. Appreciate it AJ. You must come and see India. It's such a wonderland of a country! I hope you enjoyed your trip to India Nicole. Those who go always want to come back. Let me know how it went..
You have to do it Buxomglori. It's really an amazing place!